When we think, life is better on the other side or somewhere else? We hear friends fantastic stories, we see their holiday snaps on Facebook, we learn of better paid jobs, the nicer bosses, the better and much calmer parents… and sometimes… a small part of us wishes our life was better, like theirs. It could be easy to feel down when comparing your life with others, that seem to have everything, do everything, get paid more and work less, have a better house and more well-behaved kids… but do they really? Judging from a distance and typically out of the true context, everything would seem better on the other side. While I wish I took more holidays (who doesn’t?) life is pretty good. From today – I am going to focus less energy on comparing my life with others because in reality – it is not fair, accurate or even worthwhile. I have learnt, to stop looking over the fence. Imagine the growth if I concentrated on my own patch and my own aspirations. I will no longer be driven by wanting more (whatever more is) by comparing myself with others. I have learnt, to be thankful and celebrate what I have now. 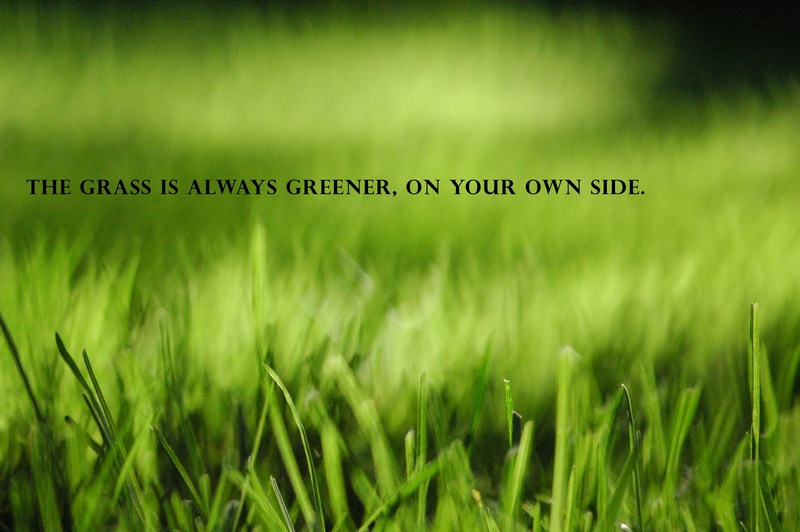 I have learnt, the grass is always greener, on my own side. Time to get back into my garden. 4 responses to Is the grass greener on the other side? Also, some of the happy people are not really happy. They appear happy. I made a vow to only pick role models and then apply their successful methods, not envy them 100%. I am nine this year!